Laid down, 19 November 1990, at Avondale Industries, Westwego, LA. 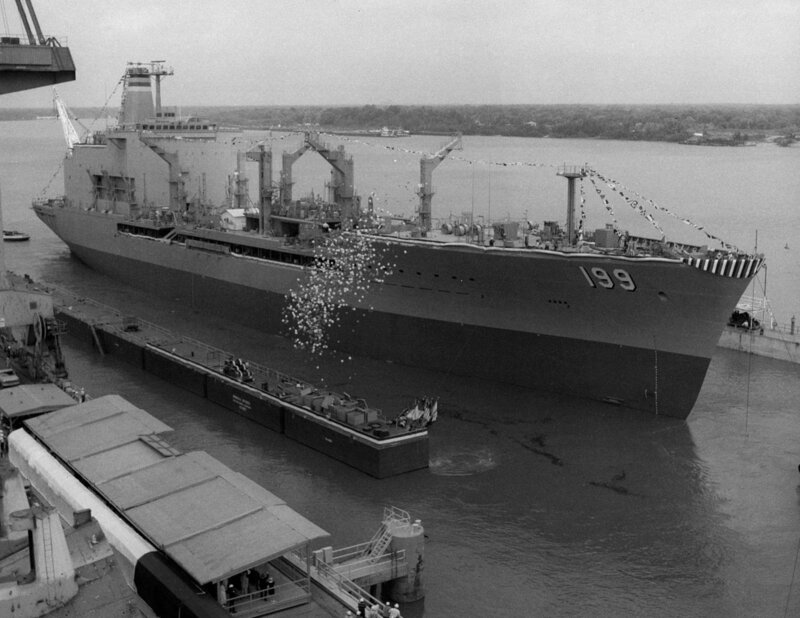 303k Tippecanoe (T-AO-199) Christening and launching, 16 May 1992, at Avondale Industries, Westwego, LA. 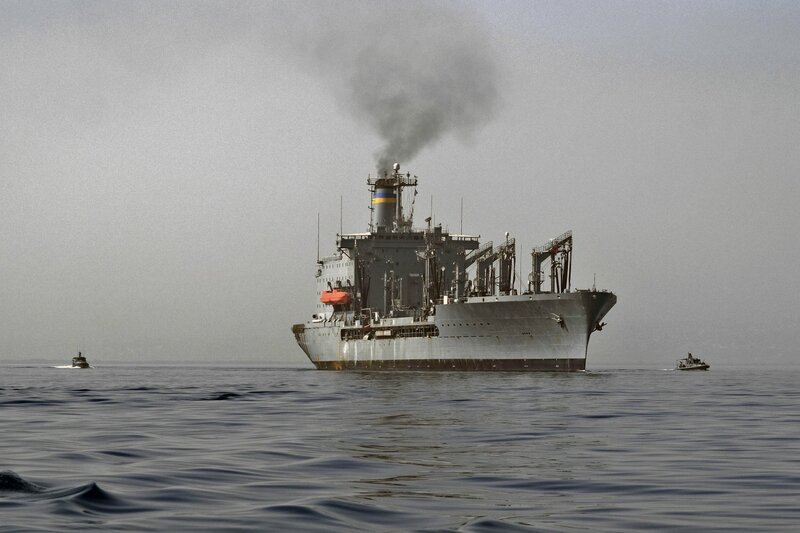 66k USNS Tippecanoe (T-AO-199) under way sometime between 1993 and 2008, location unknown. 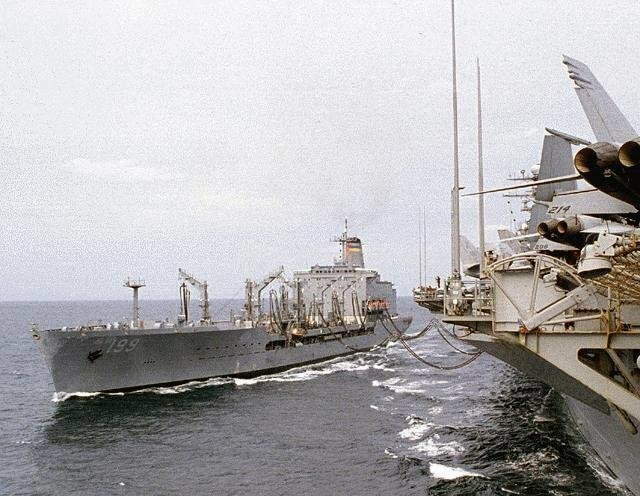 248k USNS Tippecanoe (T-AO-199) transferring fuel to USS Independence (CV-62), in March 1996 off Taiwan during the Taiwan Crisis. 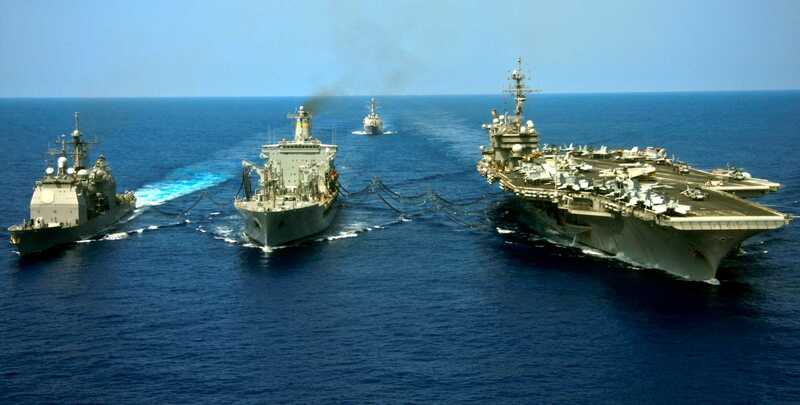 155k USNS Tippecanoe (T-AO-199) (center) conducts an underway replenishment with the Japanese Maritime Self-Defense Force destroyer JDS Haruna (DD-141) (left) and the aircraft carrier USS Kitty Hawk (CV-63), 8 October 1998. 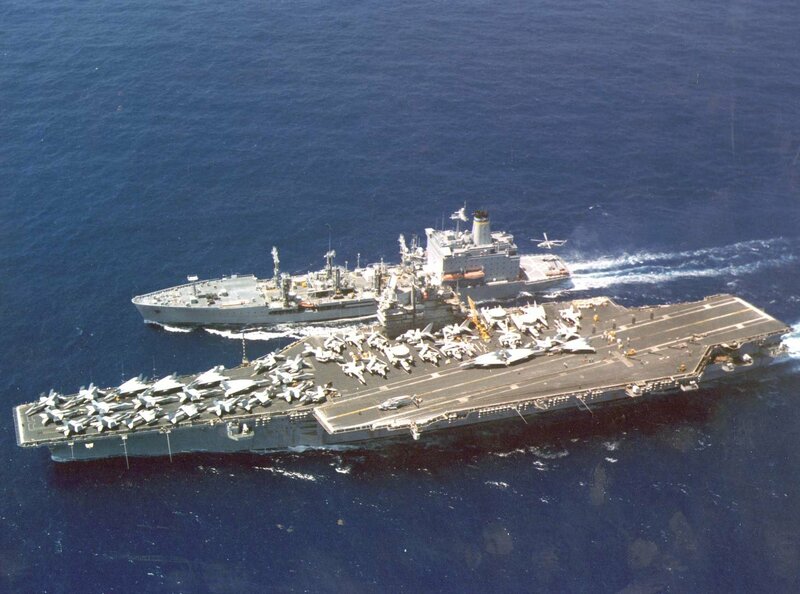 The Kitty Hawk and her escorts were conducting joint exercises with the Japanese Maritime Self-Defense Force. 84k USNS Tippecanoe (T-AO-199) transferring fuel to USS Carl Vinson (CVN-70) during an underway replenishment off the coast of California. 66k USNS Tippecanoe (T-AO-199) transferring fuel to USS Carl Vinson (CVN-70) during an underway replenishment off the coast of California. 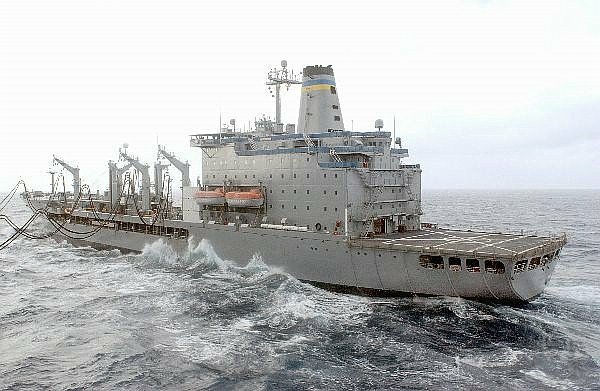 94k USNS Tippecanoe (T-AO-199) during a Replenishment at Sea (RAS) with USS Jarrett (FFG-33) off San Diego, CA., circa December 2002 - January 2003. 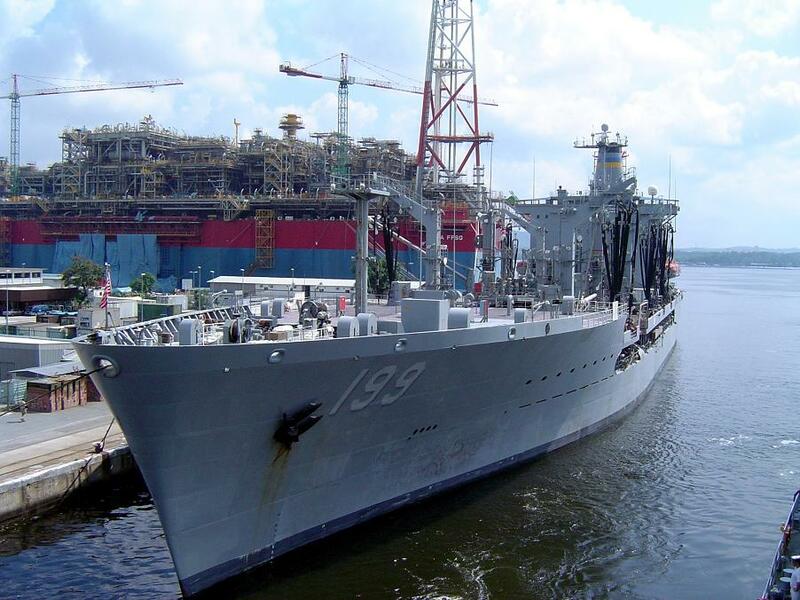 120k USNS Tippecanoe (T-AO-199) moored at Singapore, 15 February 2003. Note the New Zealand frigate HMNZS Te Kaha (F77) moored ahead of Tippecanoe. Photo by Mark Longstaff. Chris Howell, Southland Ship Stores Limited, Port of Bluff, N.Z. 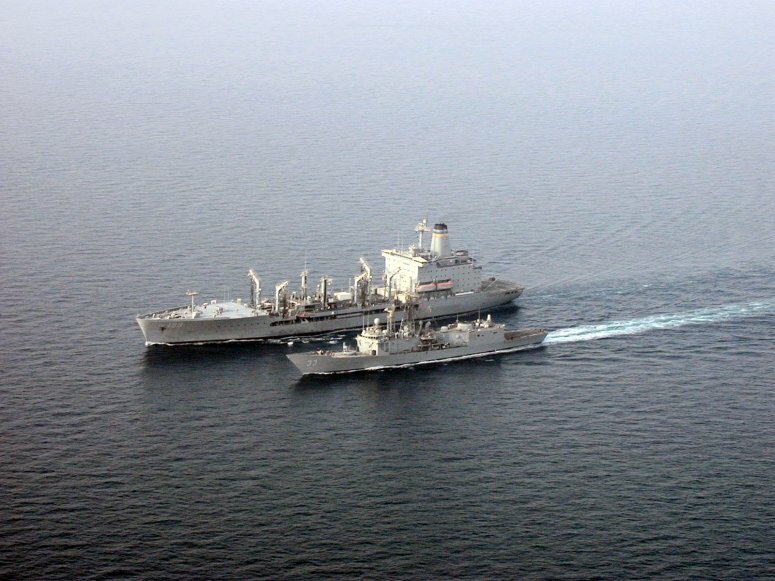 1369k USNS Tippecanoe (T-AO-199) conducts an underway replenishment with USS Bulkeley (DDG-84), as USS Cushing (DD-985) cruises behind them in the Arabian Gulf, 18 June 2004. 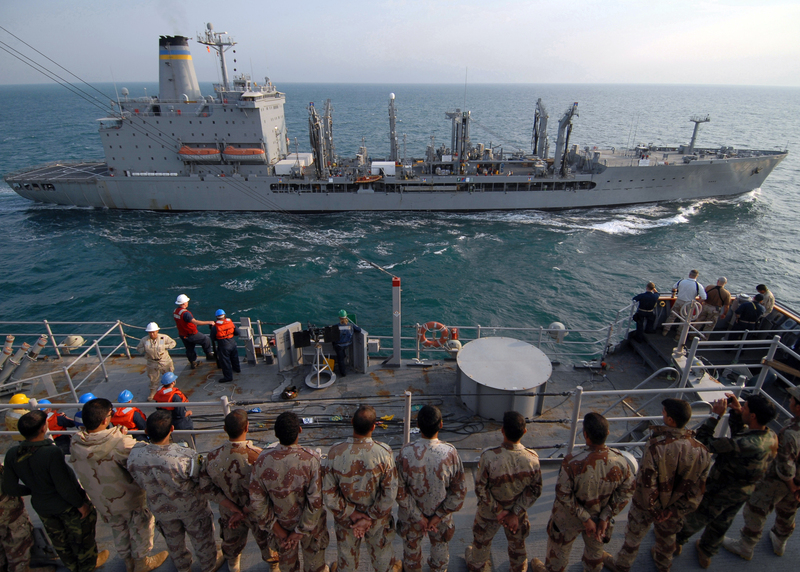 The three ships are on a regularly scheduled deployment in support of Operation Iraqi Freedom (OIF). 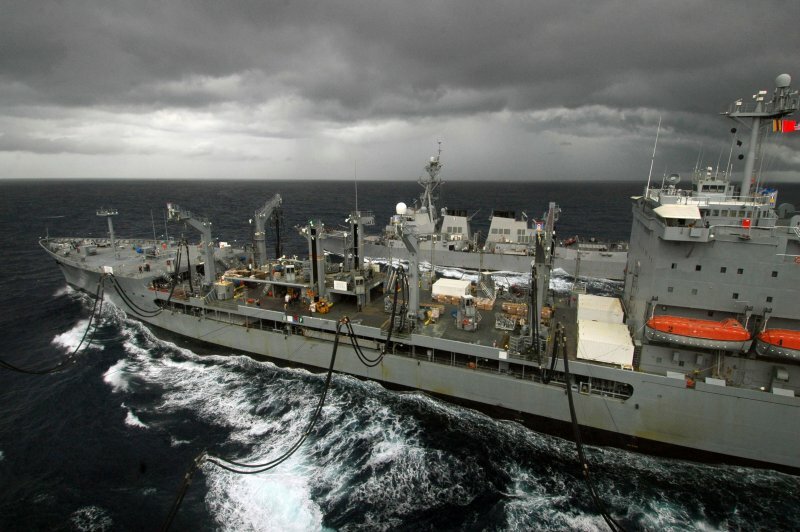 71k USNS Tippecanoe (T-AO 199) refuels USNS Mercy (T-AH-19) as combat stores ship USNS San Jose (T-AFS 7), far left, and the High Speed Vessel USS Swift (HSV-2), far right, operate alongside in the Indian Ocean, 3 March 2005. Mercy is serving as an enabling platform to assist humanitarian operations ashore in ways that host nations and international relief organization find useful. Mercy is in the waters off the Indonesian coast in support of Operation Unified Assistance, the humanitarian relief effort to aid the victims of the tsunami that struck Southeast Asia. 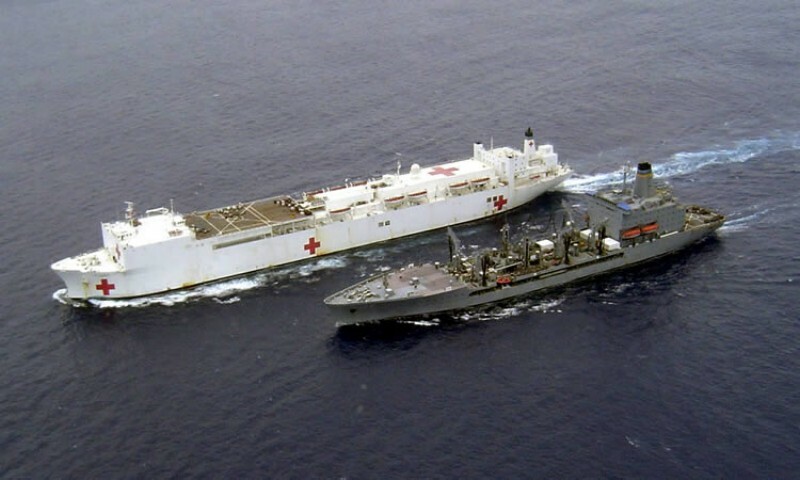 79k USNS Tippecanoe (T-AO-199) conducts a replenishment at sea with USNS Mercy (T-AH-19) in the Indian Ocean, 8 April 2005. 78k USNS Tippecanoe (T-AO-199) comes alongside USS Kitty Hawk (CV-63) during a replenishment at sea, 10 July 2006, in the Pacific Ocean. 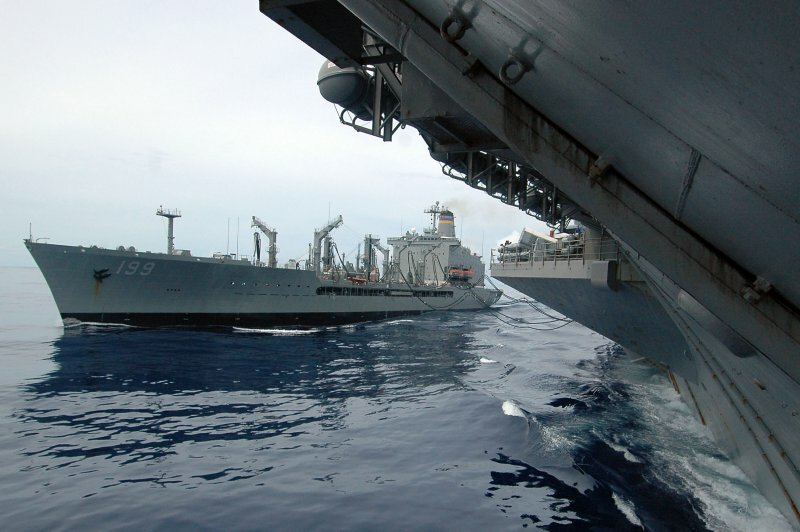 94k USNS Tippecanoe (T-AO-199) replenishes and resupplies USS Kitty Hawk (CV-63) and USS Lassen (DDG 82)in the South China Sea during a replenishment at sea, 30 August 2006. 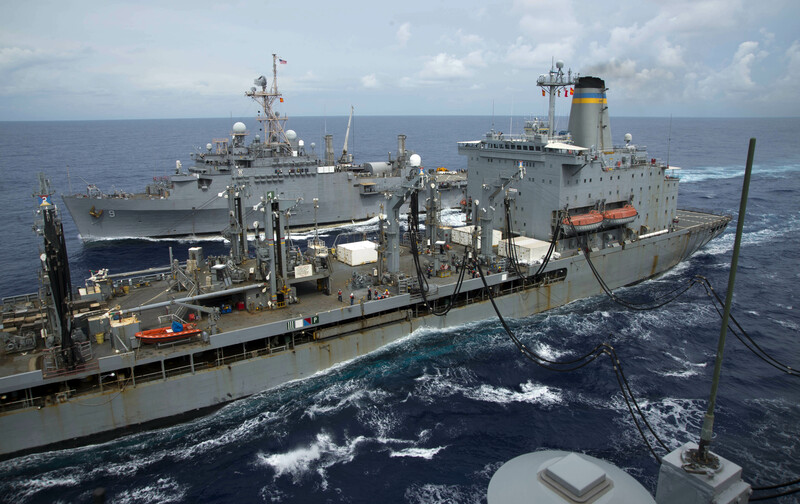 136k USS Shiloh (CG-67) (left) and USS Kitty Hawk (CV-63) (right) refueling from USNS Tippecanoe (T-AO-199) (center) while USS Lassen (DDG-82) is waiting for her turn at the pump. Western Pacific, spring 2008. 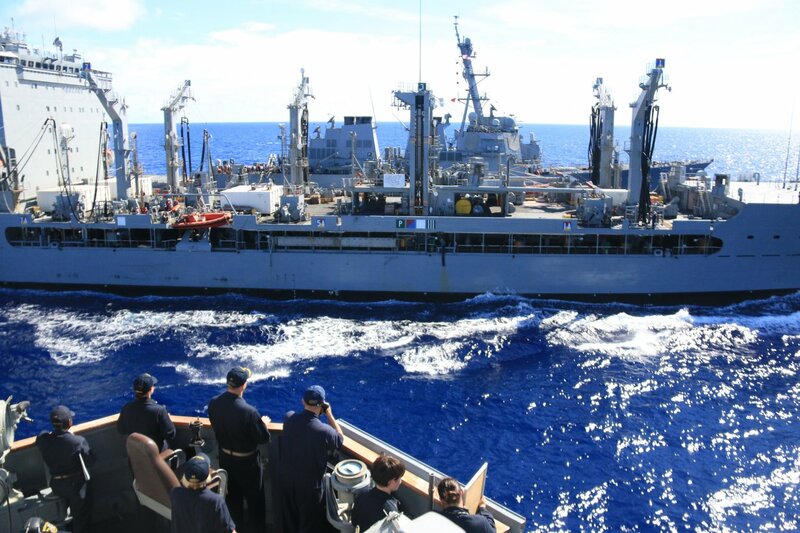 118k USS Shiloh (CG-67) (background) and USS Kitty Hawk (CV-63) (foreground) refueling from USNS Tippecanoe (T-AO-199) while USS Lassen (DDG-82) is waiting for her turn at the pump. Western Pacific, spring 2008. 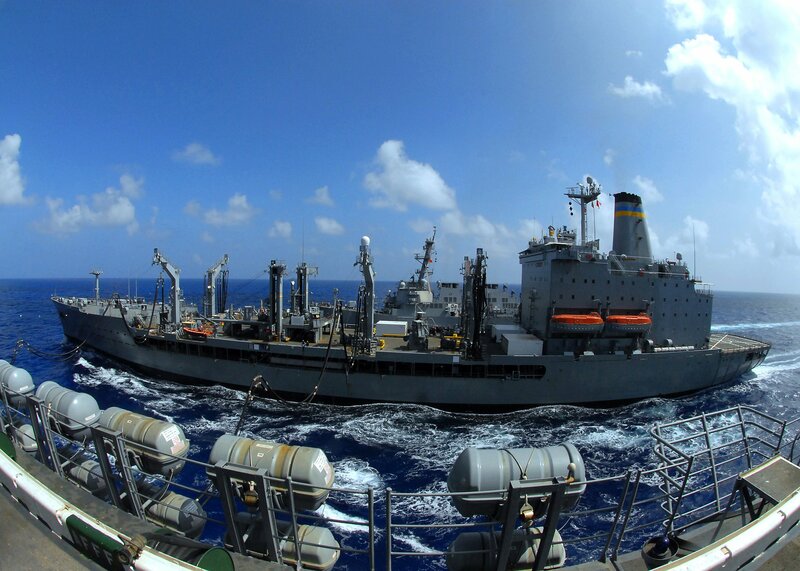 140k USS Shiloh (CG-67) (left) and USS Kitty Hawk (CV-63) (right) refueling from USNS Tippecanoe (T-AO-199) (center). Western Pacific, spring 2008. 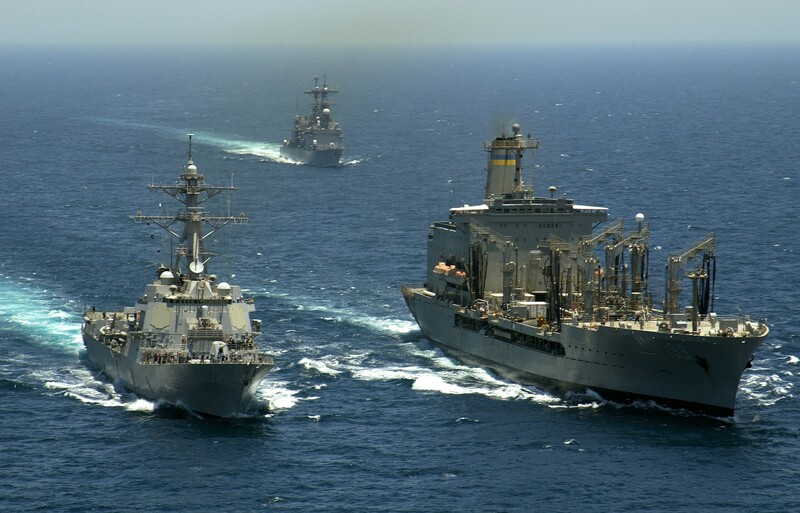 457k Sailors heave a line connecting the guided-missile destroyer USS Lassen (DDG-82), and USNS Tippecanoe (T-AO-199) during a replenishment-at-sea (RAS) operation in the Pacific, 24 April 2008. 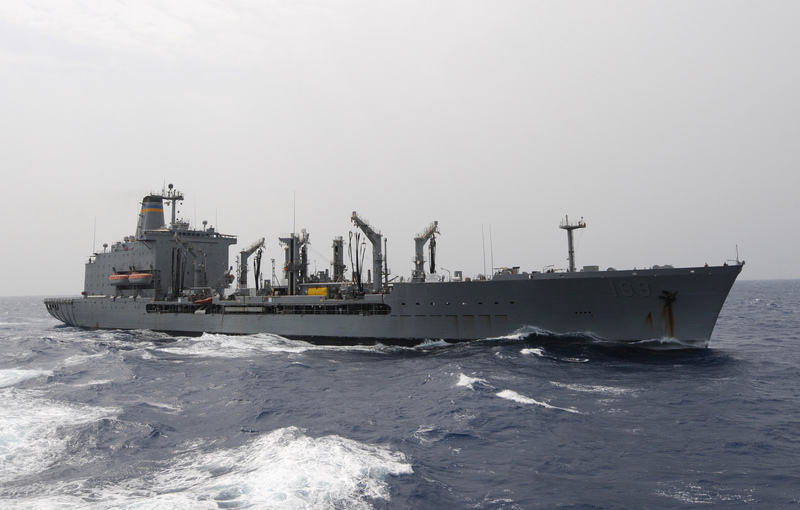 546k USNS Tippecanoe (T-AO-199) refuels USS Peleliu (LHA-5) and an unidentified DDG in the Pacific Ocean, during a replenishment at sea, 21 May 2008. 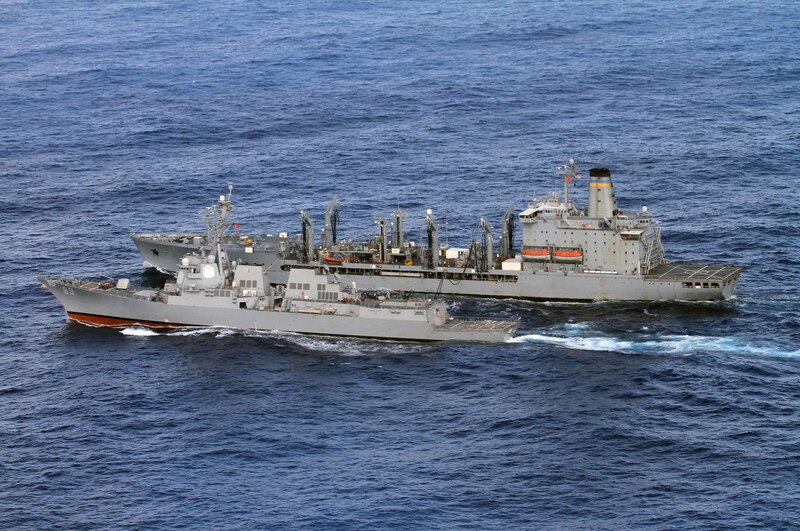 446k USNS Tippecanoe (T-AO-199) and the guided-missile cruiser USS Cape St. George (CG-71) steam alongside amphibious assault ship USS Peleliu (LHA-5), not pictured, during an underway replenishment. 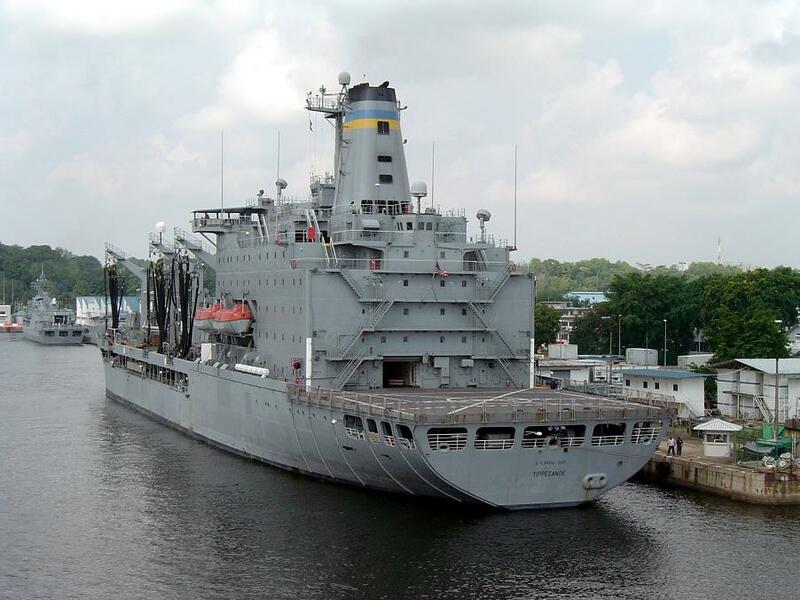 The ships are deployed supporting maritime security operations in the U.S. 5th Fleet area of responsibility. 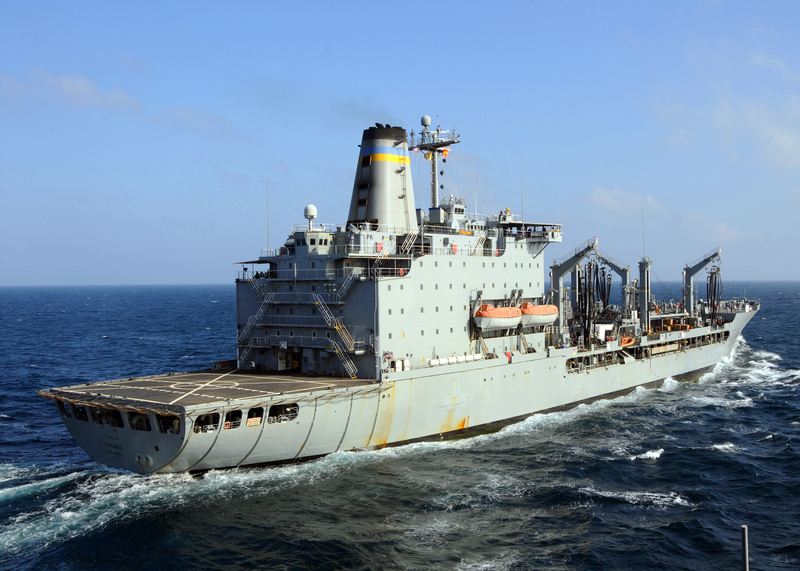 3232k Iraqi Sailors and Marines observe as USNS Tippecanoe (T-AO-199) pulls alongside the amphibious dock landing ship USS Carter Hall (LSD-50) for a replenishment at sea. Carter Hall is deployed as part of the Iwo Jima Expeditionary Strike Group supporting maritime security operations in the U.S. 5th Fleet area of responsibility. 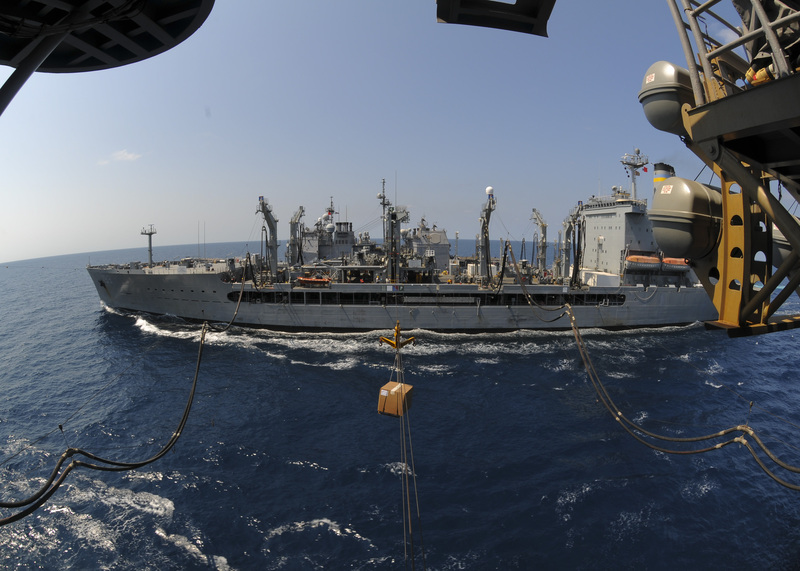 2697k An SH-60B Sea Hawk from Helicopter Anti-Submarine Squadron Light (HSL-42) Detachment 1, embarked aboard the guided-missile cruiser USS Vella Gulf (CG-72), conducts a vertical replenishment with USNS Tippecanoe (T-AO-199) and Vella Gulf. 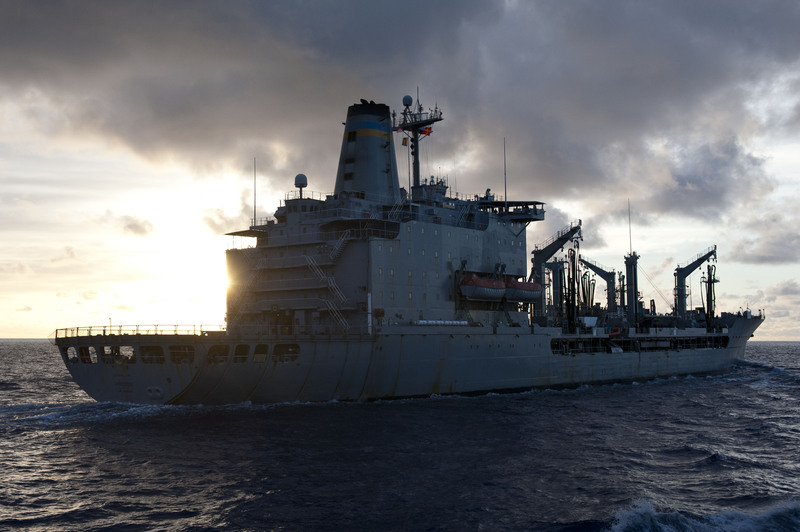 Vella Gulf is deployed as part of the Iwo Jima Expeditionary Strike Group supporting maritime security operations in the U.S. 5th Fleet area of responsibility. 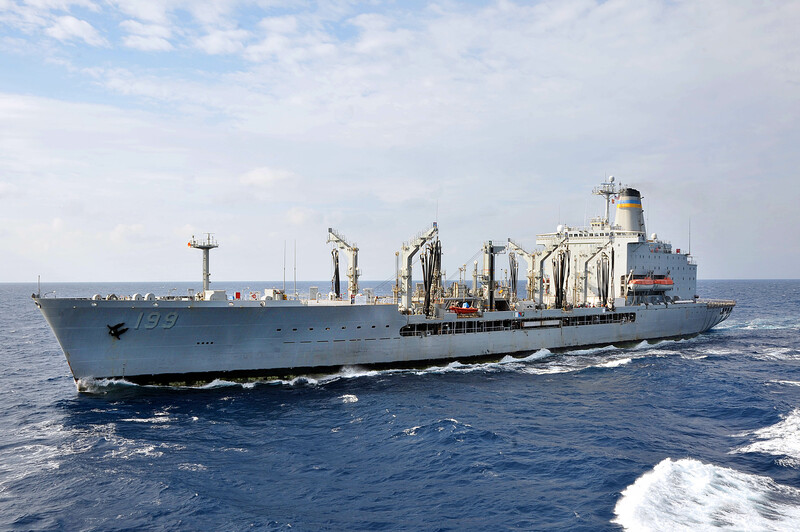 2244k USNS Tippecanoe (T-AO-199) pulls alongside the guided-missile cruiser USS Vella Gulf (CG-72) for a replenishment at sea. 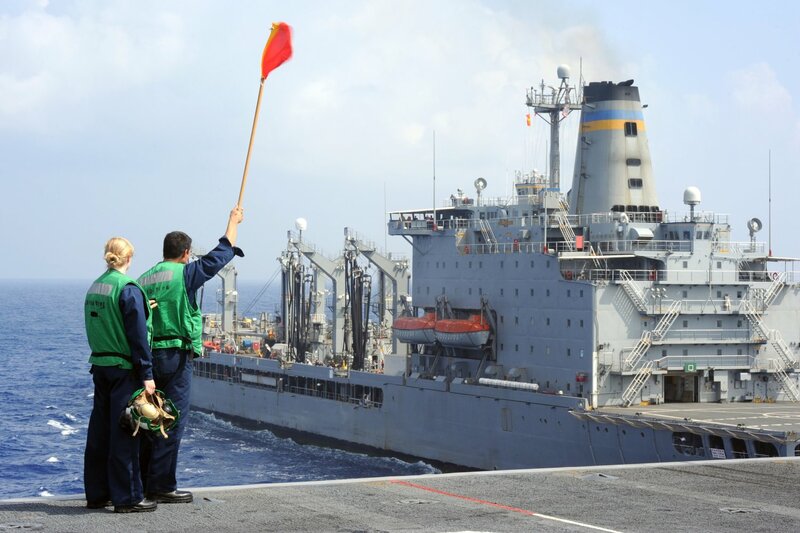 Vella Gulf is deployed as part of the Iwo Jima Expeditionary Strike Group supporting maritime security operations in the U.S. 5th Fleet area of responsibility. 1775k Sailors assigned to Deck Department aboard the amphibious transport dock ship USS San Antonio (LPD-17) watch as USNS Tippecanoe (T-AO-199) pulls alongside for an underway replenishment. San Antonio is the flagship for Combined Task Force 151, a multinational task force conducting counter-piracy operations to detect and deter piracy in and around the Gulf of Aden, Arabian Sea, Indian Ocean and the Red Sea. 421k The guided-missile cruiser USS Lake Champlain (CG-57) pulls alongside USNS Tippecanoe (T-AO-199) during an underway replenishment. Lake Champlain is part of the Boxer Amphibious Ready Group (ARG) and is on a regularly scheduled deployment is in support of global maritime security. 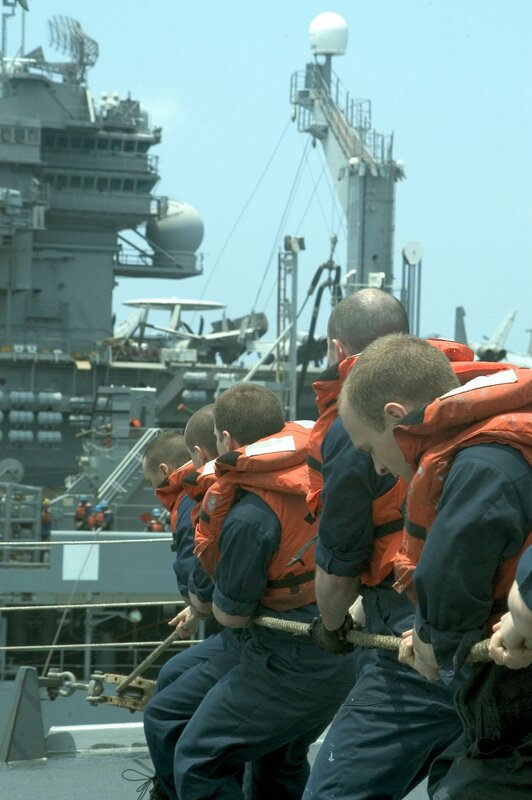 The Boxer ARG is operating in the US Navy's 7th Fleet area of responsibility. 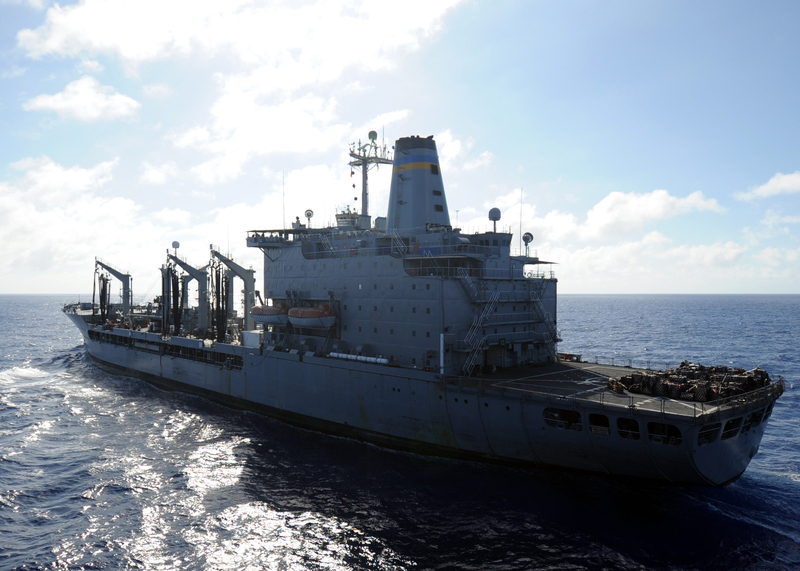 947k The forward-deployed amphibious assault ship USS Essex (LHD2) receives supplies from USNS Tippecanoe (T-AO-199) during an underway replenishment. 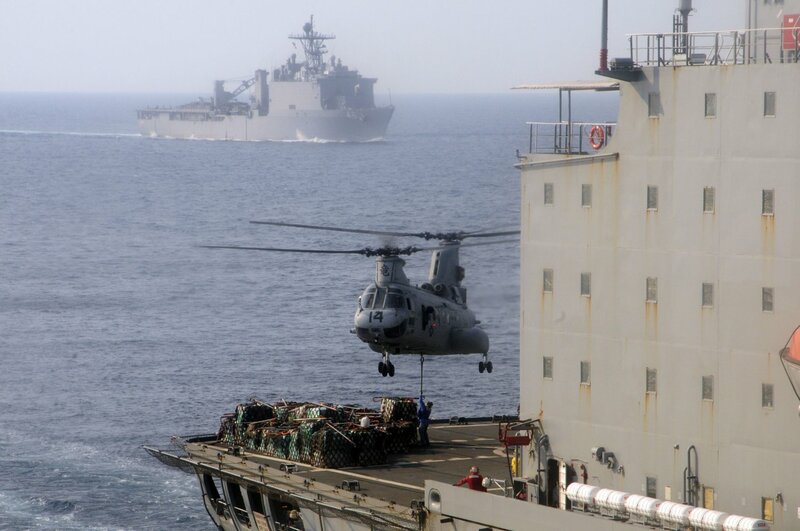 Essex is part of the forward-deployed Essex Amphibious Ready Group and is participating in Cobra Gold 2010, a co-sponsored U.S.-Thailand multinational exercise. 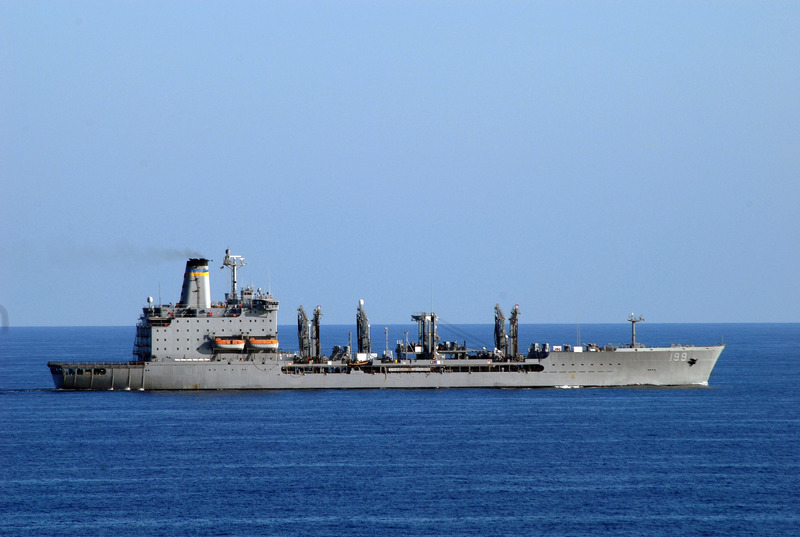 1507k USNS Tippecanoe (T-AO-199) transits the Pacific Ocean. 1578k USNS Tippecanoe (T-AO-199) steams alongside the aircraft carrier USS George Washington (CVN-73) during a replenishment at sea. George Washington, the Navy's only permanently forward-deployed aircraft carrier, is participating in Undersea Warfare Exercise (USWEX), an annual bilateral exercise involving the Japan Maritime Self-Defense Force and the U.S. Navy. 799k USNS Tippecanoe (T-AO-199) pulls alongside the aircraft carrier USS George Washington (CVN-73) during a replenishment at sea. The ability to replenish its ships at sea contributes to the Navy's vast reach and continued mission readiness. George Washington is currently helping to ensure security and stability in the waters west of the Korean peninsula. 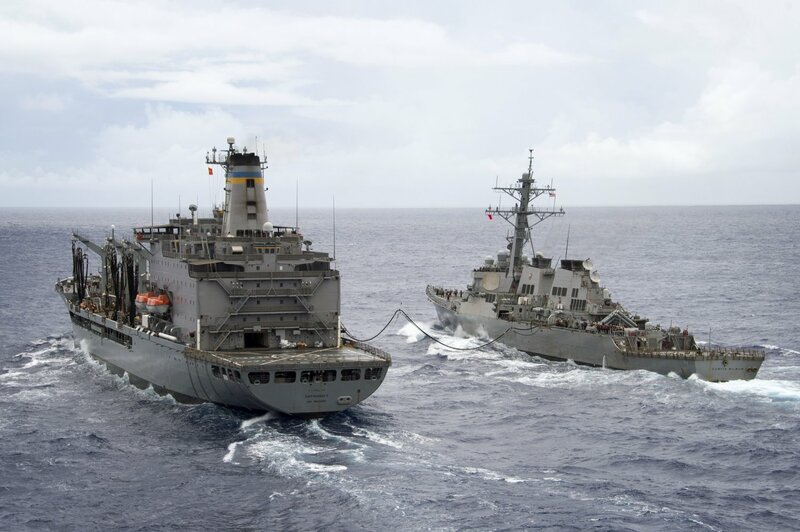 1522k USS Blue Ridge, right, USNS Tippecanoe (T-AO-199) center, and the guided-missile destroyer USS Stethem (DDG-63) conduct an underway replenishment while underway in the Pacific Ocean. 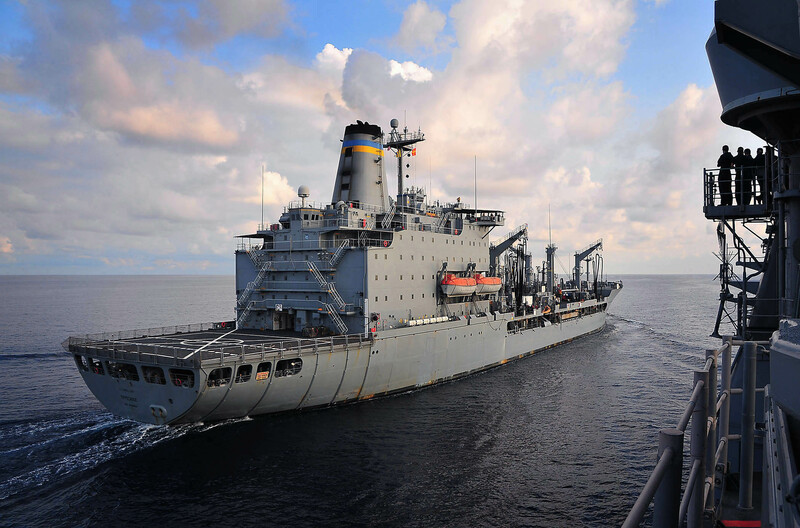 284k USNS Tippecanoe (T-AO-199) center, conducts underway replenishment with the amphibious assault ship USS Boxer (LHD-4) and the amphibious transport dock ship USS Green Bay (LPD-20). Boxer is the flagship of the Boxer Amphibious Ready Group and is underway supporting maritime security operations and theater security cooperation efforts in the U.S. 5th Fleet area of responsibility. 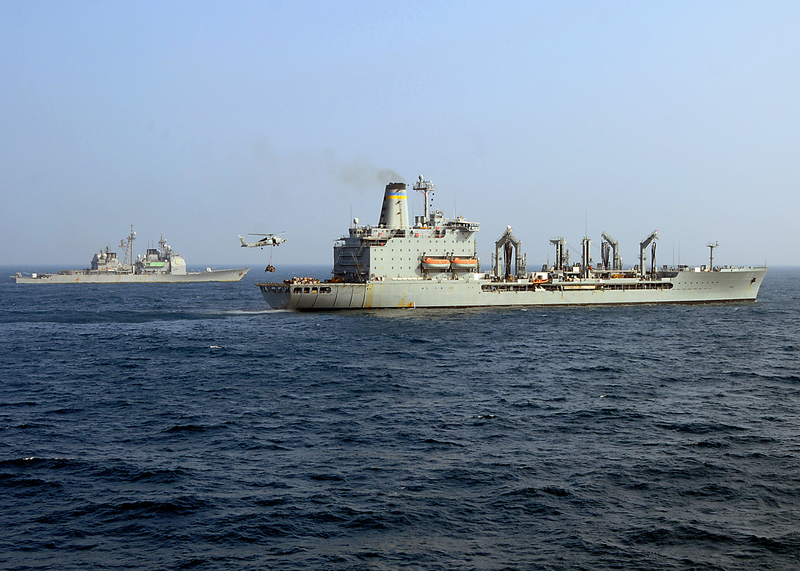 840k USNS Tippecanoe (T-AO-199) transits the Gulf of Aden during a replenishment at sea with the guided-missile destroyer USS Truxtun (DDG-103), not shown. 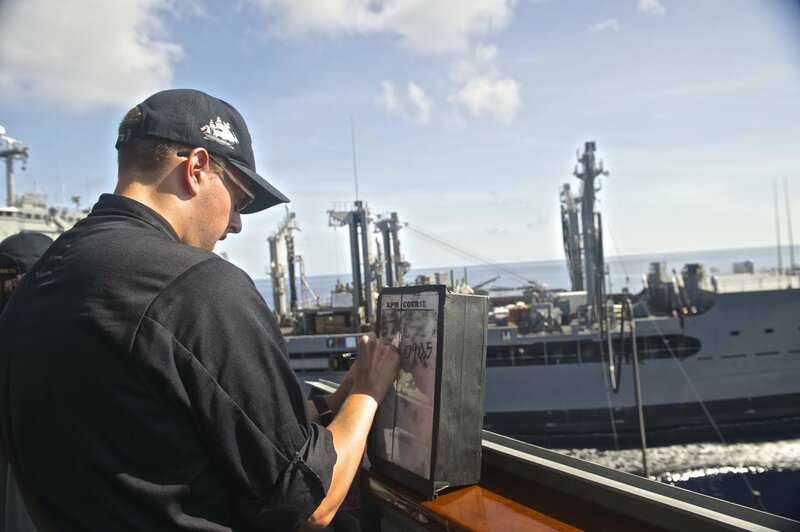 Truxtun is on a scheduled deployment supporting maritime security operations and theater security cooperation efforts in the U.S. 5th Fleet area of responsibility. 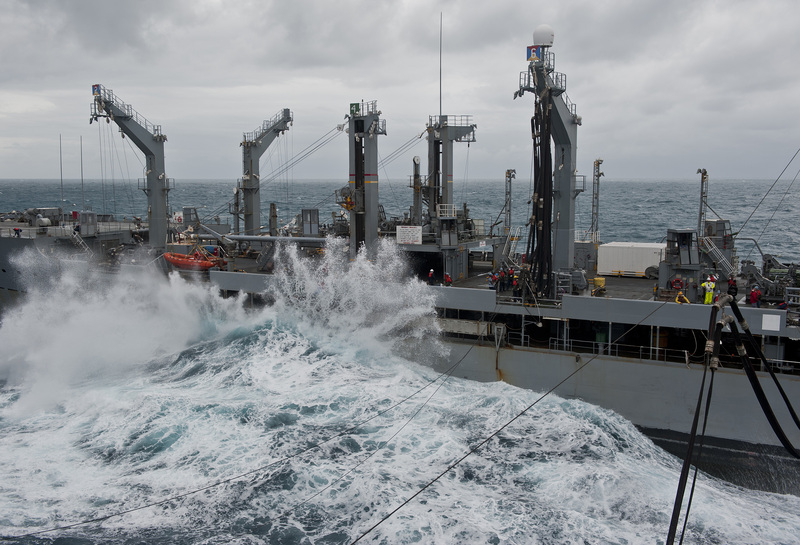 1159k Heavy waves crash against USNS Tippecanoe (T-AO-199) during a replenishment at sea with the amphibious assault ship USS Makin Island (LHD-8). 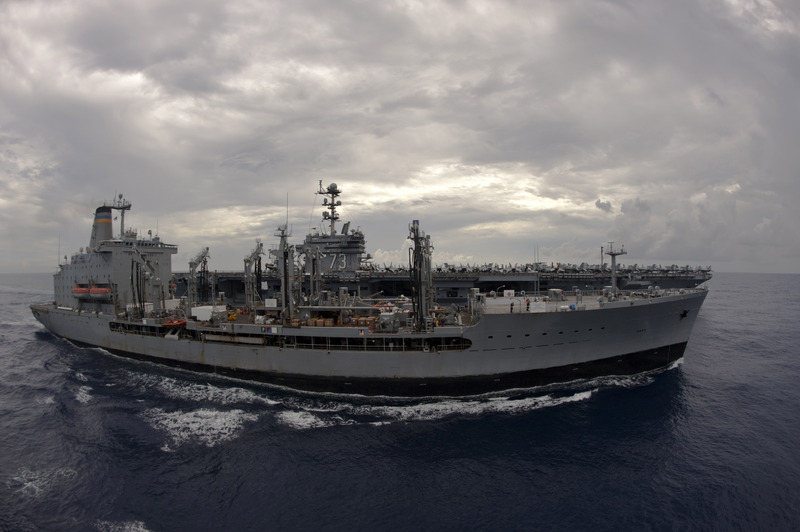 Makin Island is on its maiden deployment conducting operations in the U.S. 7th Fleet area of responsibility in support of the Navy's Maritime Strategy. Makin Island is the Navy's newest amphibious assault ship and the only U.S. Navy ship with a hybrid electric propulsion system. 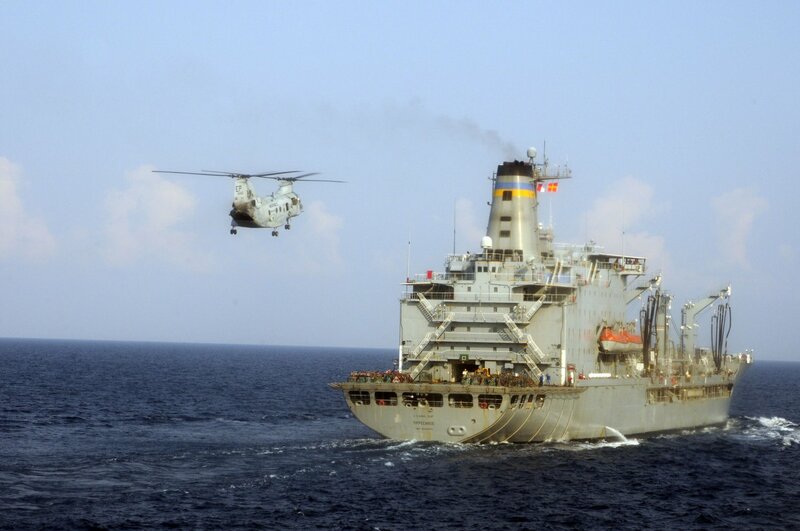 200k A CH-46 Sea Knight helicopter flies toward USNS Tippecanoe (T-AO-199) during a replenishment at sea with the with the forward-deployed amphibious dock landing ships USS Germantown (LSD-42) and USS Tortuga (LSD-46). Germantown, with embarked elements of the 31st Marine Expeditionary Unit (MEU-31) is under way after participating in Exercise Cobra Gold 2012, an annual Thai-U.S. co-sponsored joint and multinational exercise designed to advance security throughout the Asia-Pacific region and enhance interoperability with participating nations. 216k Sailors aboard USNS Tippecanoe (T-AO-199) attach cargo to a CH-46 Sea Knight helicopter during a replenishment at sea with the with the forward-deployed amphibious dock landing ships USS Germantown (LSD-42) and USS Tortuga (LSD-46) (not pictured). 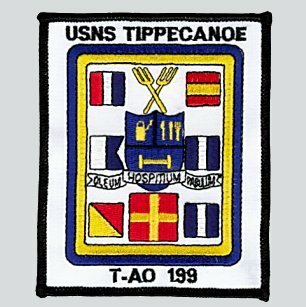 1282k USNS Tippecanoe (T-AO-199) during an underway replenishment with the forward deployed aircraft carrier USS George Washington (CVN-73) George Washington is forward deployed to Yokosuka, Japan, and is underway in the U.S. 7th Fleet area of responsibility. 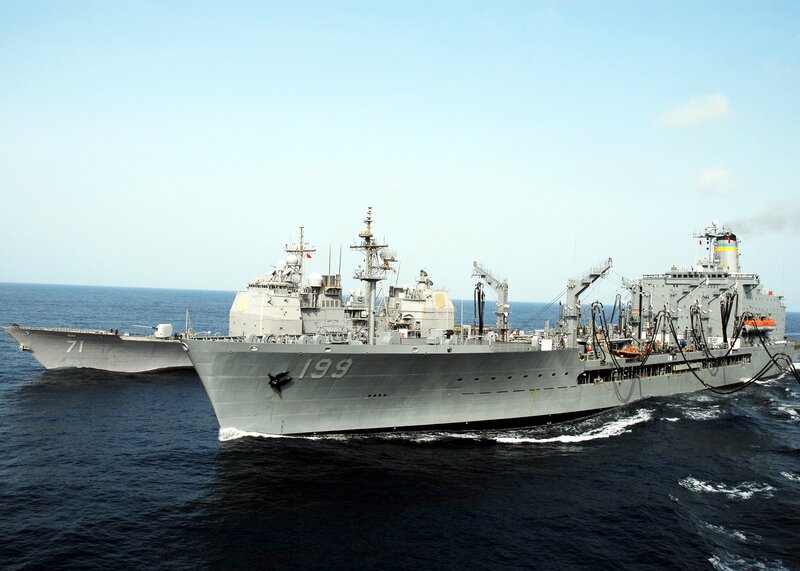 269k USNS Tippecanoe (T-AO-199) prepares to come alongside the Arleigh Burke-class guided-missile destroyer USS McCampbell (DDG-85), not pictured, during a replenishment at sea. McCampbell is part of the George Washington Carrier Strike Group, the U.S. Navy's only forward deployed carrier strike group based out of Yokosuka, Japan, and is currently conducting a routine patrol in the western Pacific region. 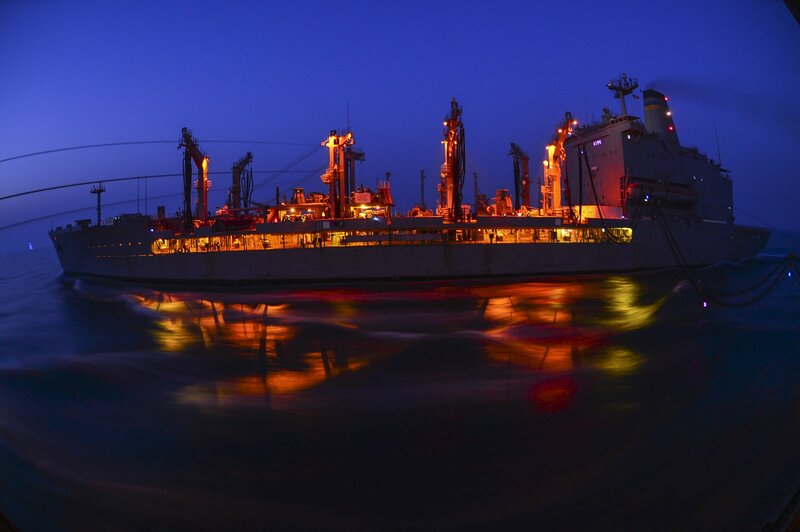 1237k USNS Tippecanoe (T-AO-199) holds a steady course as the Ticonderoga-class guided-missile cruiser USS Cowpens (CG-63) pulls alongside for an early morning underway replenishment. 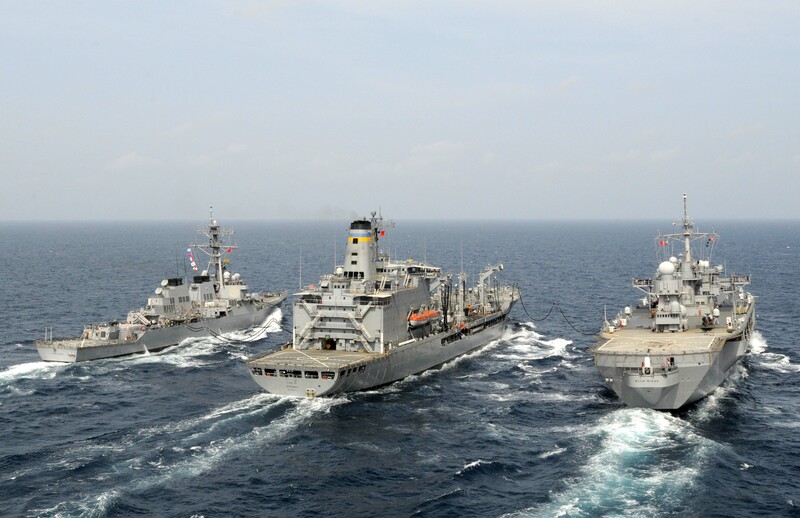 1358k The amphibious transport dock ship USS Denver (LPD-9), far left, pulls alongside USNS Tippecanoe (T-AO-199) to conduct a dual replenishment at sea with the forward-deployed amphibious assault ship USS Bonhomme Richard (LHD-6) (not shown). 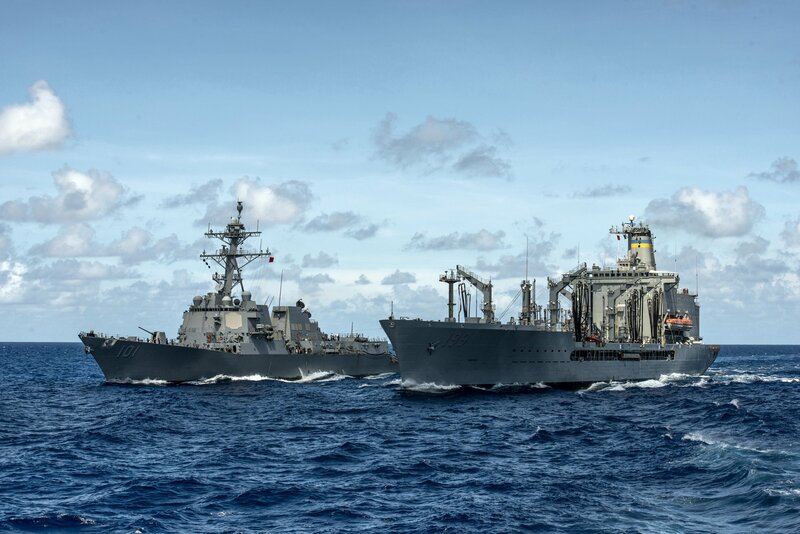 1425k The guided-missile destroyer USS Mustin (DDG-89), left, conducts a replenishment at sea with USNS Tippecanoe (T-AO-199). Mustin is currently on patrol in the western Pacific Ocean. 248k QMSN Chris Jurado, right, and QMSN Janet Dahlman, wave a guide flag on the flight deck of the aircraft carrier USS George Washington (CVN 73) during a replenishment-at-sea with USNS Tippecanoe (T-AO-199). 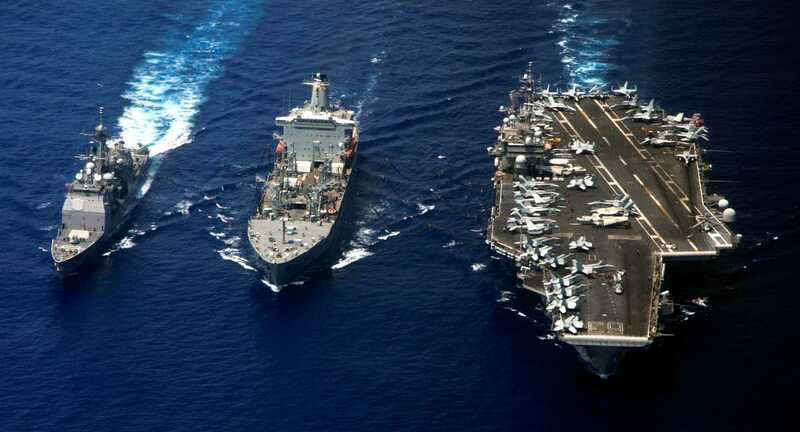 USS George Washington (CVN-73) and her embarked air wing, <Carrier Air Wing (CVW-5), provide a combat-ready force that protects and defends the collective maritime interest of the U.S. and its allies and partners in the Asia-Pacific region. 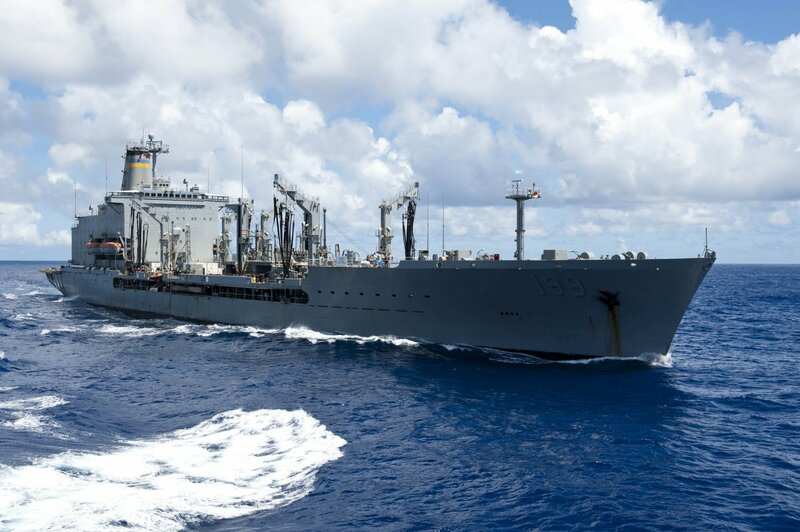 992k USNS Tippecanoe (T-AO-199) underway in the US 7th Fleet area of responsibility after completing a replenishment-at-sea with the Arleigh Burke-class guided-missile destroyer USS McCampbell (DDG-85). McCampbell is part of the George Washington Carrier Strike Group, the US Navy's only continuously forward-deployed carrier strike group, based out of Yokosuka, Japan, and is currently conducting a routine western Pacific patrol in support of regional security and stability of the vital Asia-Pacific region. 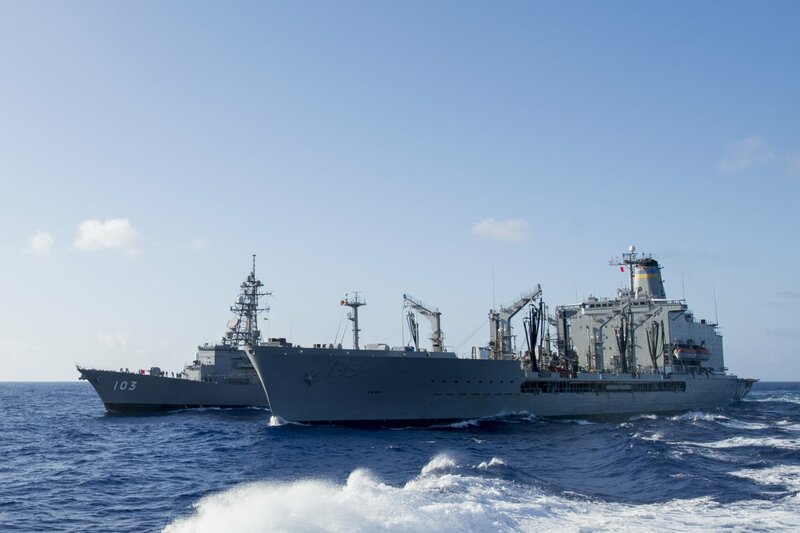 467k USNS Tippecanoe (T-AO-199) conducts a replenishment-at-sea with the guided-missile destroyer USS Gridley (DDG-101). Gridley is a unit of the Carl Vinson Carrier Strike Group deployed to the U.S. 7th Fleet area of operations supporting security and stability in the Indo-Asia-Pacific region. 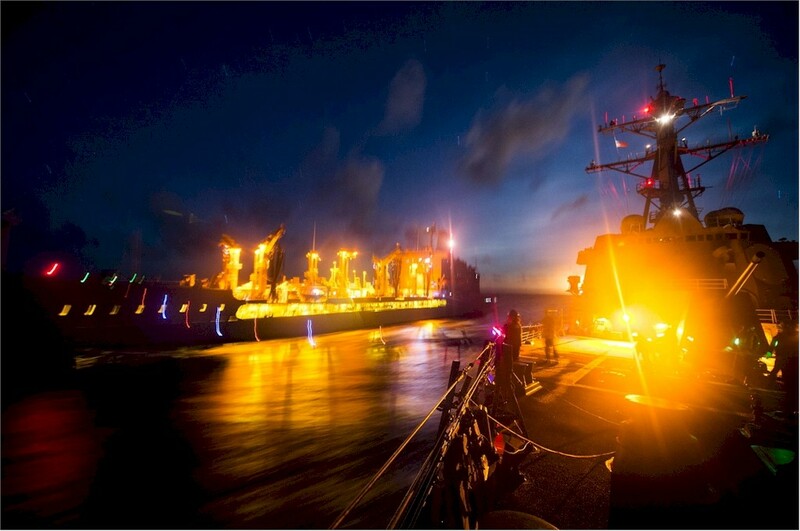 233k The Arleigh Burke-class guided-missile destroyer USS McCampbell (DDG-85) conducts a replenishment-at-sea with USNS Tippecanoe (T-AO-199). McCampbell is on patrol with the Carrier Strike Group Five (CSG 5) in the U.S. 7th Fleet area of responsibility supporting security and stability in the Indo-Asia-Pacific. 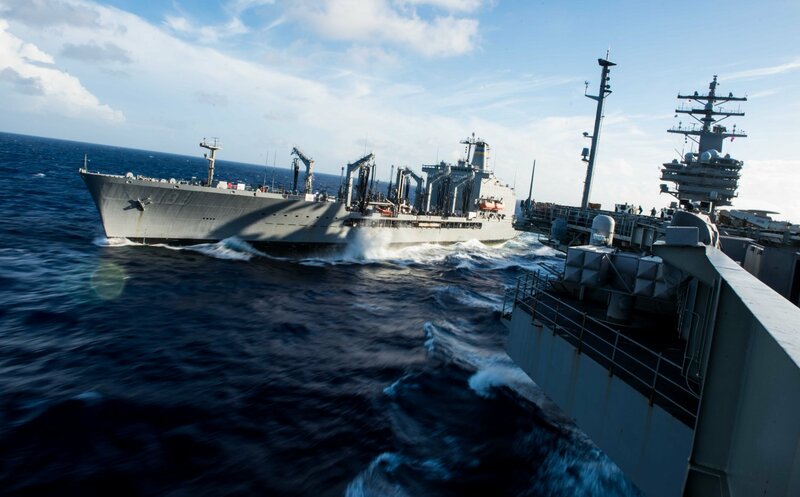 136k The forward-deployed Arleigh Burke-class guided-missile destroyer USS McCampbell (DDG-85) conducts a replenishment-at-sea with USNS Tippecanoe (T-AO 199) in the Philippine Sea, 16 September 2016, during Valiant Shield 2016. Valiant Shield is a biennial, U.S. only, field-training exercise with a focus on integration of joint training among U.S. forces. 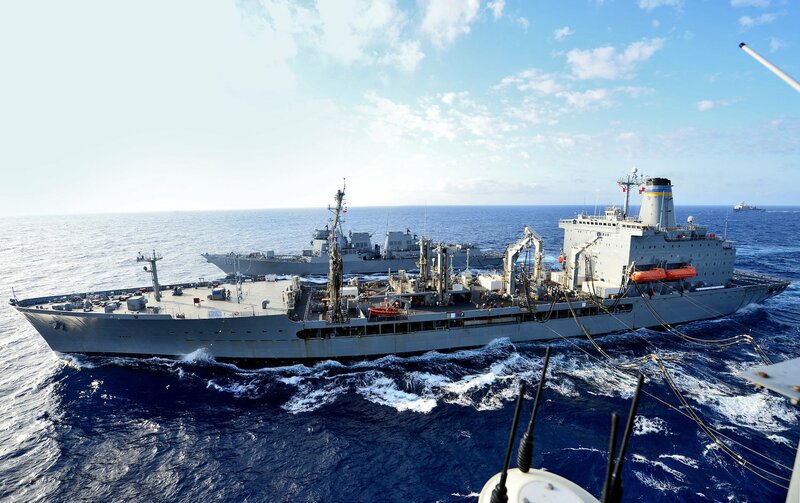 253k The Arleigh Burke-class guided-missile destroyer USS Curtis Wilbur (DDG-54) and USNS Tippecanoe (T-AO-199) conduct refueling alongside the amphibious assault ship USS Bonhomme Richard (LHD-6) (not seen) during a replenishment at sea (RAS). Bonhomme Richard, flagship of the Bonhomme Richard Expeditionary Strike Group, is operating in the Philippine Sea in support of security and stability in the Indo-Asia Pacific region. 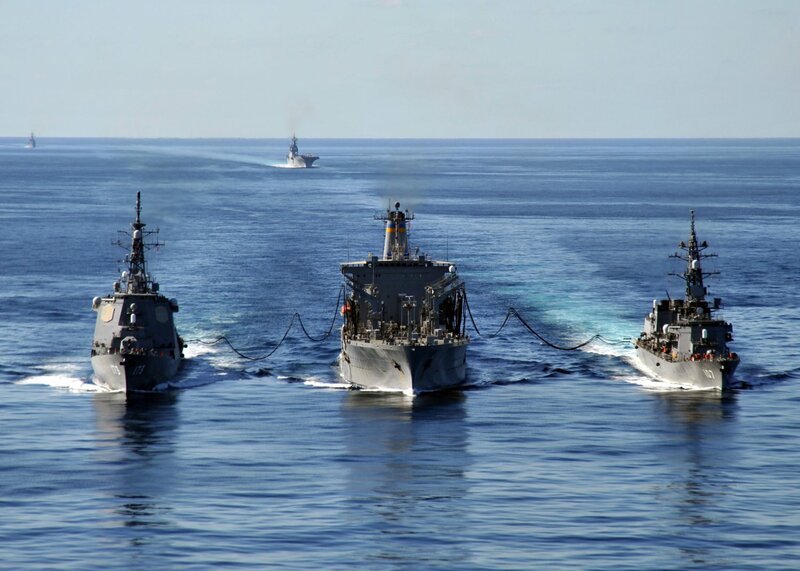 158k The Japan Maritime Self-Defense Force (JMSDF) Murasame-class destroyer Yudachi (DD-103) receives fuel during an underway replenishment (UNREP) with USNS Tippecanoe (T-AO-199). Yudachi is on patrol conducting routine operations in the Philippine Sea with Carrier Strike Group Five (CSG 5) supporting security and stability in the Indo-Asia-Pacific region. 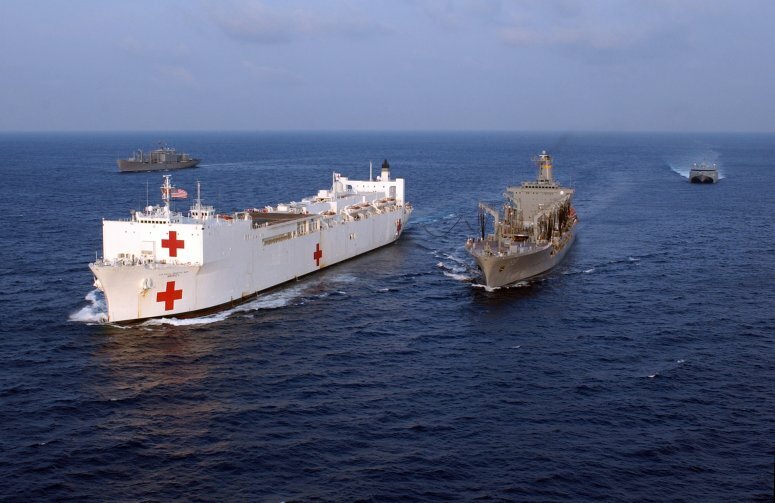 250k Sailors assigned to Coastal Riverine Squadron (CRS) 1 provide harbor and seaward protection for USNS Tippecanoe (T-AO-199) through the coastal waters of Djibouti City, Djibouti. CRS-1 is forward-deployed in the U.S. 6th Fleet area of operations and conducts the full spectrum of joint and naval operations, often in concert with allied, joint, and interagency partners, in order to advance U.S. national interests and security and stability in Europe and Africa. 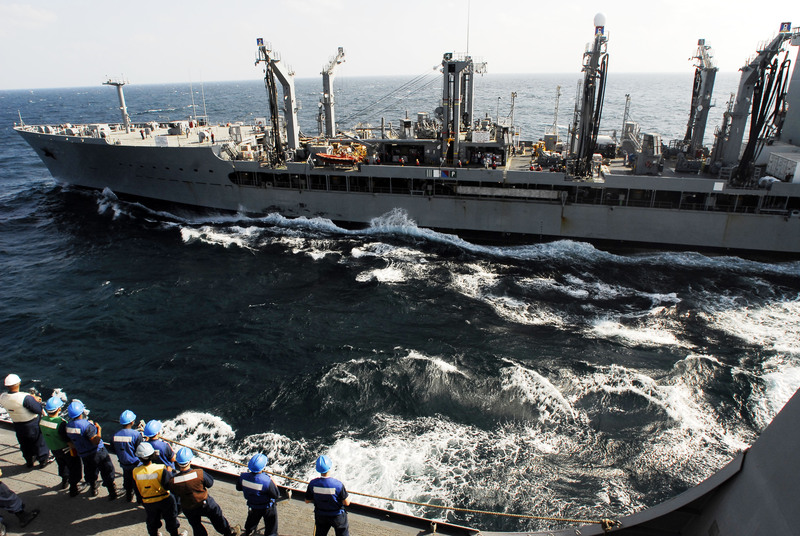 353k USNS Tippecanoe (T-AO-199), center, conducts a replenishment-at-sea with the Arleigh Burke-class guided-missile destroyer USS Dewey (DDG-105) and the amphibious assault ship USS Wasp (LHD-1). Wasp and Dewey, part of the Wasp Expeditionary Strike Group, with embarked 31st Marine Expeditionary Unit (31st MEU), are operating in the Indo-Pacific region to enhance interoperability with partners, serve as a ready-response force for any type of contingency and advance the Up-Gunned ESG Concept. 192k USNS Tippecanoe (T-AO-199) steams alongside the Navy's forward-deployed aircraft carrier, USS Ronald Reagan (CVN-76), during a replenishment-at-sea. 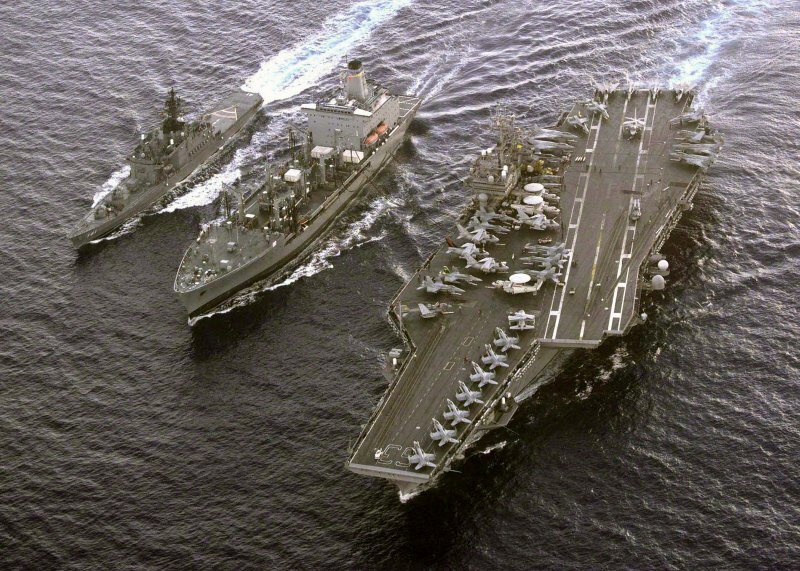 Ronald Reagan, the flagship of Carrier Strike Group 5, provides a combat-ready force that protects and defends the collective maritime interests of its allies and partners in the Indo-Pacific region.